Almost every parent looks ahead with mixed feelings to the point in their child’s life when they will finish school and move on to become independent young adults. However, this is not always the case, especially for those who are parents of children with developmental disabilities. These parents have to face the reality that 93% of children with disabilities will be unemployed upon leaving the public school system and most will remain unemployed for their entire life. When parents come around to facing the facts of reality, they are put in a dilemma as to what the next point in life is for their child. Noah’s Ark’s website states that due to a severe lack of adequate funding, there are over 18,000 individuals who are on a waiting list to receive services. New applicants for support services are being told the wait could be 10 to 15 years. In fact, it is only when parents become too old to properly care for their children that the Agency for Persons with Disabilities will place these individuals in a group home or facility. At this point in their life, it becomes very difficult for these individuals to grow and learn healthy habits that will empower them to live independently. In addition to all of this, the divorce rate is near 90% for parents of children with developmental disabilities. Kosik informed me that most families are single-parents trying to earn a living to support their family and they come home to tend to the needs of a child with disabilities. When their seems to be no hope in such circumstances, especially with the State of Florida ranking 47th in providing support services, where can parents turn to find help? Parents in the Lakeland area can find relief and hope in Noah’s Ark, a local organization that empowers individuals with developmental disabilities to learn how to become independent so that they can experience all that God intends for their lives. 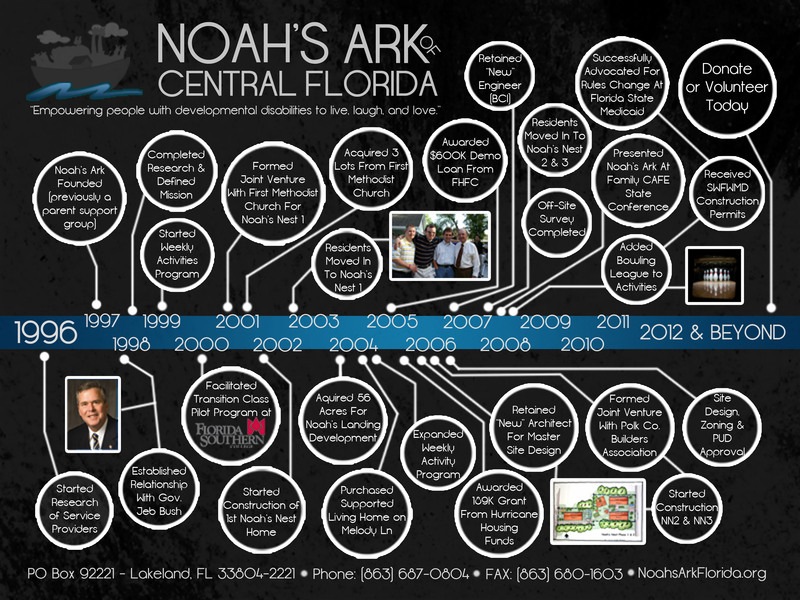 Noah’s Ark has been serving the Lakeland area since 1997. The organization grew out of a parent support group named “Parent to Parent.” “Parent to Parent” is a national organization that connects parents so that they do not feel that they are alone in dealing with the most trying issues of raising a child with developmental disabilities. Kosik informed me that he had already been looking into such questions and did not like what he was finding. If something happened to him at the time, she would likely be placed into a group home where quality of living is poor at best. She wouldn’t know any of the people and she would be cared for by constantly changing caregivers that are were paid close to minimum wages. People in group homes do not even get the privilege of making decisions for themselves, such as what they will be eating, when they will be eating, what they would be watching on television, and what leisure activities to participate in. It was in the moment of Kosik sharing these concerns in the group support setting that he awakened similar concerns of other parents. As he brought about his concerns, other parents began looking ahead to their child’s future. Out of about a dozen families that were involved in the “Parent to Parent” group, five chose to change their focus to changing what their child’s future quality of life would be like. It is this shift in focus that started Noah’s Ark. In the process of developing the organization Kosik and the others felt the excitement of a positive change as they searched and discovered an array of organizations across the world. They saw how they were addressing the needs of individuals with developmental disabilities and knew that there was hope. The group traveled throughout Florida and to five different states to look at dozens of organizations to help them “crystallize” their vision. Noah’s Ark still holds meetings as a support group regularly and anyone interested in attending is welcome. They are constantly helping educating and counseling parents on how to prepare for their child’s future needs. They inform people about the legal, financial, and guardianship issues to help them have their house in order. The next membership meeting is Thursday, January 12, 2012. In this meeting they will be featuring a speaker from The Center for Guardian-Advocacy. She will discuss how families can protect their child through using a flexible and affordable form of guardianship. The membership meetings are open to individuals and families that support the organizations mission and goals. Dr. Steven Fettke is a professor in the College of Christian Ministries and Religion at Southeastern University. He is also the father of twin daughters and a 27 year old son, Philip, who is autistic. I sat down and talked with Dr. Stephen Fettke about Philip and how Philip’s autism has affected their family’s life. We discussed what it has been like being the parent of a child with autism, Philip’s education and current life, their struggles, how they have coped, and what Dr. Fettke knows of Noah’s Ark. Dr. Fettke stated that the greatest challenge is all the attention that is needed. It detracts from one’s own situation with their spouse and other children. He expressed how fortunate he is to have a wife as well that was supportive and helpful. He also discussed how he founded a parent support group but it was difficult for the parents to find the time to actually meet together because they were also so busy with taking care of their child. His advice to parents is to connect with social services, find an understanding faith group that will help them struggle with their handicapped child, and if they can’t find that, at least another believer who is patient and willing to pray with them and support them. Dr. Fettke has also written a very an article in the Journal of Pentecostal Theology titled “The Spirit of God Hovered Over the Waters: Creation, the Local Church, and the Mentally and Physically Challenged, A Call to Spirit-led Ministry.” The journal article examines aspects of God’s creation, God’s image, and true Spirit-led ministry, in order to point the Pentecostal/Charismatic Church to the biblical witness that calls for ministry to all people in all states of their creation. In the article Dr. Fettke discusses his experience along with the need to include and involve those who are mentally and physically challenged in the life of the local church. He also discusses the importance of remembering and being there for those who have been broken by caring for disabled or ill family members. Click play below to hear my full interview with Dr. Fettke. Dr. Fettke voiced his satisfaction with Florida’s school system in his son’s experience. When an individual with developmental disabilities is in school, parents can be at peace knowing that someone is watching after them and caring for them. Without an organization like Noah’s Ark or any kind of day training, many individuals with developmental disabilities will exit school and stay at home unattended. While some are okay, others get into trouble, can be exploited, and some even get arrested. As individuals with developmental disabilities become engaged with other Noah’s Ark participants, many parents see their child blossom. Parents discover that their child can do a lot more than they ever imagined. The reason Noah’s Ark is so successful is that there is such love and acceptance. Noah’s Ark is more than an organization, it is an extended family. Parents can begin to relax knowing that they have done all they can do for their child and that their child is in an accepting and loving environment. This entry was posted in Feature Story COMM 2423 and tagged autism, Developmentally Disabled, Disabilities, Disabled, Florida, hope, independence, Lakeland, marriage, Parenting.